Welcome, we are pleased about your interest in our apartment and welcome you as guests in our house. If you do not want to book now, please send us a message to the landlord. We will gladly answer your questions. Apartment currently allows for direct online booking only credit card payment. If you prefer a different method of payment, please use the function message to the landlord before. Our apartment has a bedroom with double bed, one bedroom with two single beds, a bathroom, a kitchen and a living-dining room, where there is a couch that can be easily converted into a double bed or two single beds. So you can sleep up to six people with us. In addition to the sofa bed you sleep in our comfortable on Tempurmatratzen. 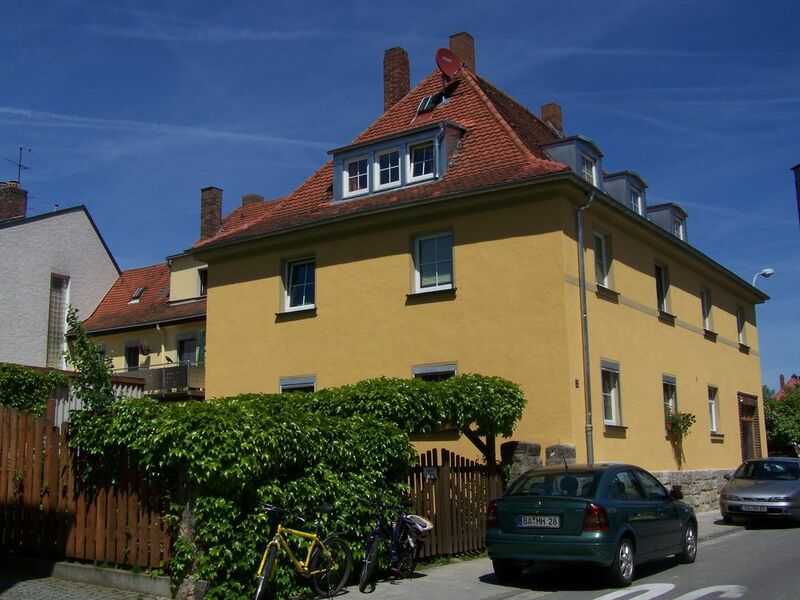 From our quiet yet conveniently located apartment you can walk in around 25 minutes by the gardener district, a part of the world heritage city of Bamberg, in the city center. However, two bus lines (line width-direction 931, 901 to Garden City) in about 150 m away (bus stop: Kloster Banz-Straße) are available. From there it is only 100 meters to our house. You see our house at the bakery outlet with red awnings. 200 meters away there is a children's playground. Free Parking is available in front of our house. From our quiet yet conveniently located apartment you can walk in around 25 minutes by the gardener district, a part of the world heritage city of Bamberg, in the city center. However, two buses in about 150 m from the building. You reach the apartment of Henry Eck slightly from the A73 motorway (exit Bamberg-south or exit Bamberg-east) and from Highway 70 (exit Bamberg). Parking right outside the front door are available. In the house there is a bakery outlet. If you wish, you can go shopping for fresh bread from Monday to Saturday. Homemade jam is available on request at no charge to your breakfast. Our apartment offers comfort for four people. The sofa bed provides in the case of the case room for two more people. The apartment has two bedrooms, living and dining room, kitchen, bathroom with shower and toilet. Butcher, supermarket, photo shop, doctor and dentist, two Italian restaurants and a tanning salon are in the immediate vicinity. In about 5 minutes walk you are in a beer bar and in 7 minutes you reach an Indian restaurant. In two minutes on foot to the nearest bus stop (Kloster Banz Street) in the Zollnerstraße (lines 901 and 931 as well as night bus line 935). The night bus stops here. From there it is only two stops to the station. The university town of Bamberg is one with its Old Town, but also with only a few minutes away from our house gardener quarter since 1993 as a World Heritage Site by UNESCO. For the tradition of its breweries Bamberg is also known as the world-famous for its cathedral and the diversity of its medieval and baroque old town. For theater and music lovers, the ETA Hoffmann Theatre and the Bamberger Symphoniker offer a rich program. From our apartment you can explore the beauty of the city and find trips Franconian Switzerland, Nuremberg, Würzburg, Coburg or the baroque architecture of Franconia in Kloster Banz, Vierzehnheiligen and Pommersfelden. Relax in the Upper Main-Therme Bad Staffelstein invites. In the evening you will find a variety of specialties in the rich gastronomic landscape around Bamberg. Wir haben ein langes Wochenende mit 4 Erwachsenen und 2 Kinder (~1Jahr) in der Wohnung verbacht und unseren Aufenthalt genossen. Mit dem nahegelegenen Bushaltestelle konnte das Zentrum sehr gut erreicht werden, aber auch zu Fuß war es kein Problem. Beim nächsten Besuch werden wir etwas mehr Zeit mitbringen, damit wir auch den 13 Brauereien Weg komplett begehen können.